Please note that the judgments of the nations of Matthew 25:31-46 takes place 1000 years before the Great White Throne judgment. So they cannot possibly be entering into the lake of fire at this time. The Great White Throne judgment takes place 1000 years after Matt.25:31-46 and it is then that the lake of fire which is the second death takes place. Also note that Satan is cast into the abyss when Christ comes back. This also takes place 1000 years before the lake of fire. 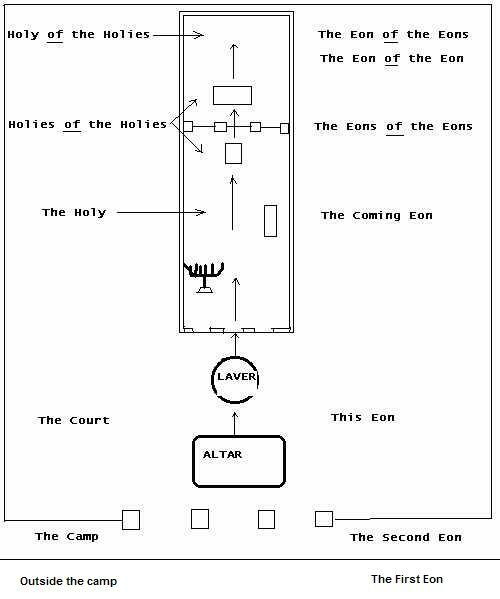 Matthew 25:41 "Then shall He be declaring to those also at His left, `Go from Me, you cursed, into the fire eonian, made ready for the adversary and his messengers" (Concordant Literal New Testament). 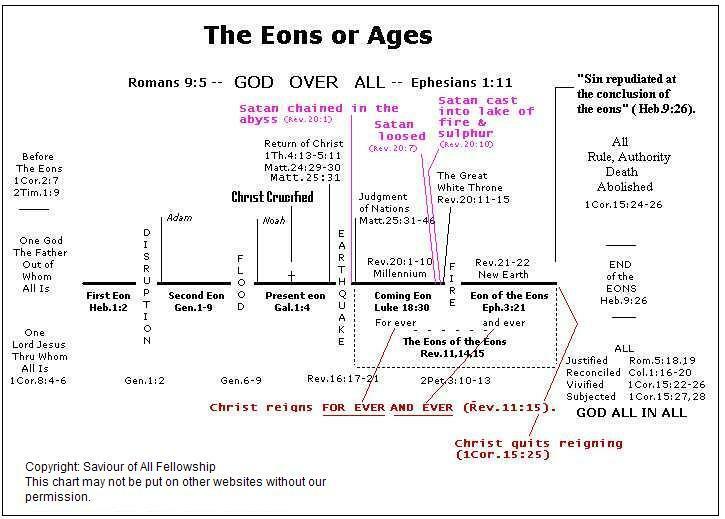 "The eon of the eon"
"The eon of the eons"
"The eons of the eons"
Now in contrast to these great events from the book Revelation, let us return to the “fire eonian” of Matthew 25:41, the “fire” which ensues at the beginning of the thousand years. It is a figure of the kid nations’ painful, eonian chastening, during the coming eon, according to the writings of the prophets. The fire is like that mentioned by the prophets which overtakes those nations which oppose Israel. Here, in Matthew 25, the fiery judgment is extended to eonian proportions in order to preserve Israel during the era of the kingdom. Within the terms of the account, it seems certain that the ones in view for whom this "fire" is said to be made ready are “the adversary” (not “Adversary”)–i.e., any adversarial nation (or group of nations)–and its associated “messengers”*–political avocates or exponents, envoys (accredited representitives) or other protagonists who had spoken against Israel. These will therefore be chastened accordingly in the day of the Lord. Angellos (“messenger”) is some times used of mortal men (e.g., John the baptist Matt.11:10). The word speaks of one’s office, not of one’s nature. Though it is often used of celestial couriers this is not its meaning. It simply refers to one who carries, or propounds, a message, regardless of his own nature or the character his message. Similarly, “adversary” is not a proper noun; it by no means is always used in reference to the great spirit being, Satan (e.g., I Tim.3:11; 2 Tim.3:3; Titus 2:3). During the thousand years, he is confined in the “submerged chaos” (Rev.20:3; abussos, SIMULTANEOUS SUBMERGE, "the abyss beneath the water level," KEYWORD CONCORDANCE, p.291). It is therefore impossible to identify Satan as the “adversary which is in view in Matthew 25:41 or otherwise to include him in this judgment of the nations. Diabolos (“adversary”), used here in Matthew 25:41, is a noun, dative, masculine, singular. Autou (“his”), literally, is “of him,” or, “of it” (of-SAME; the relative pronoun; genitive, masculine, third person, singular). The fact that these two words are both masculine in gender merely signifies grammatical agreement. It has no bearing on translation, much less on interpretation. This setting in Matthew calls to mind the language of the Hebrew prophets. Israel in Egypt is figured as a burning thorn bush (Ex.3:2; cp v.7). They were in an “iron furnace” or “crucible” (Deut.4:20; 1 Kings 8:51; Jer.11:4). Isaiah, in 48:10, explains it as a crucible of humiliation. When used figuratively, a “crucible” is a “severe trial”: Jerusalem has been melted in the crucible of affliction. Yahweh blew upon her in the fire of His indignation (Ezek.22:18-22; cf Mal.3:2; Obadiah 18). The judgments of the nations during the day of Yahweh (in the coming eon) are spoken of in the prophets under the figure of fire. God will send a fire on Magog and the isles (Ezek.38:22; 39:6). He will set a fire in Egypt in the day of Yahweh (Ezek.30:8,16; cp Zech.14:17,18). He will blow against the Ammonites with the fire of His indignation (Ezek.21:31). If all the nations hostile to Israel were actually consumed by a raging conflagration, what need would there be for the “iron club” with which He will be shepherding the nations in that day (Rev.19:15)? They will be afflicted and forced to obey, as Israel in Egypt. This will be their corrective chastening (Matt. 25:46). Fire is often used figuratively, and of temporary judgments. Even the saints will be saved thus, “as through fire” (1 Cor.3:15; cp 1 Pet.1:7; 4:12). Even setting aside the vital considerations of time element and administrational distinction which concern these various events, in itself the popular notion that this passage, Matthew 25:31-46, somehow speaks of ourselves and the gospel of our salvation by grace is a clear index of the depth of the prevailing darkness Concerning God's true grace. For we enter into eonian life–and at a far higher level and in a much more glorious way than these “sheep” nations--solely as the objects of God's grace, apart from any consideration of our works. Yet they do so as a reward for their works. Yet, even so, for these very nations, this allotment was made ready for them “from the disruption of the world” (Matt.25:34), Since it was essential nonetheless for them to qualify for thus allotment, it is evident that they only acted as Israel’s benefactors because Yahweh Elohim directed their steps to do so (cf Prov.l6:9). There is no “free will” here. There no risk involved, no human independence. God alone will be glorified in that day. Though it is an impossible equation, Some have confounded this judgment with that of the great white throne. Let us note Some of the differences: this severing of the nations Occurs at the unveiling of Jesus at the beginning of the millennium (cp Matt. 24:29; 25:31); the great white throne is after the millennium (Rev.20:7,11). It is on the earth, in the valley of Jehoshaphat (cf Joel 3:2); not at a time when heaven and earth flee and no place is found for those who stand before the great white throne (Rev.2O:11,12). It concerns only the living nations of that day; yet those who stand before the throne are the rest of the dead following the millennium (cp Rev2O:5a). It concerns living nations, not dead individuals roused for judgment. Its basis is the respective nations’ characteristic treatment of the Jews corporately, not every detail of each sinner’s life who has ever lived considered individually. Its consequence is the dividing of the nations of the earth into those blessed and cursed with respect to the millennium, not the condemnation of the unbeliever to the second death which occurs at a much later time. Many, indeed, “shall incur the justice of eonian extermination from the face of the Lord, and from the glory of His strength” (2 Thess.1:9). The day of Christ’s unveiling from heaven will come “in flaming fire” in which He, and His powerful messengers, will be “dealing out vengeance to those not acquainted with God and those who are not obeying the evangel of our Lord Jesus Christ” (2 Thess. 1:7b,8). Yet it is in that very day that we will be at “ease,” even as Paul, Silvanus, and Timothy, totally uninvolved in the events of that fearful era (cp 2 Thess.1 :1,7a). For we are awaiting God’s Son out of the heavens, Whom He rouses from among the dead, Jesus, our Rescuer out of the coming indignation (1 Thess.1:10). Yet this is only so because of the “transcendent grace” of God which has come upon us (2.Cor.9:14b).